Our Ready2Reel range offers both free standing and tegometal integrated merchandisers which will house chain, rope and tubing products along with popular fittings to suit. The reels are housed on individual axles which have a unique breaking system which helps to keep the merchandiser looking orderly. The fittings are housed on euro-hooks on a tegometal board situated above the reeled products. All merchandisers are supplied with the appropriate cutting equipment and the handy plastic strip in front of the reels is ideal for product and pricing information. This range offers merchandising units in five widths - 25cm, 50cm, 75cm, 100cm & 125cm, designed to suit any retail requirement from small DIY/Hardware shops to large retail outlets. Our Ready2Go range offers chain and rope in pre-cut lengths. The merchandisers are created using tegometal components and euro-hooks which will suit most retail outlets. The fittings, ropes and light domestic chains are housed on suitable euro-hooks and the heavier welded chains are housed on re-enforced euro-hooks that fit onto a rear support bar. This system can also be supplied with a shelf to house sash cords, strings, twines and other popular products. This range has proven very successful in outlets where the cutting of chain can be an issue and we are very proud to have pioneered the presentation of chain & rope in this format. Each item carries a full product description label and a barcode label for ease at point of sale. The merchandising units are available in three widths - 50cm, 100cm & 125cm. 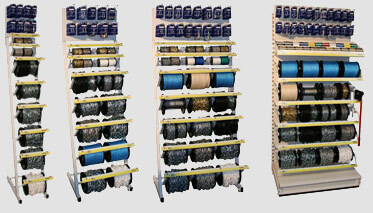 Our Ready2Roll range offers chain and rope in their own unique dispenser. This range is ideal for the store that simply has no room for a merchandising unit. The chain and rope is housed in its own unique box which contains a reel system within. This allows the product to be placed on shelves but still acts as though on a dispenser. The range has been based on our most popular selling items and the boxes have a space for full product information and pricing labels.